I have a New Theory of Brambles and the pruning thereof. I have had a New Theory approximately once a year for the last six years or so. I am aware of the accepted horticultural Theory of Brambles; I posses a large book on the pruning of things, and I have even read it. The problem is, the brambles are the wild illiterate boisterous sort, and they have not read the pruning book, hence, about once a year I have a New Theory of Brambles. I cut my brambles according to the current theory, I manage them, often for some months into the growing season, but at some point the Theory breaks down. Every time. Still, we have a freezer full of blackberries, so I’m not doing too badly. Arthur and Percy have been overseeing the pruning work, they say the Theory is a good one this year. 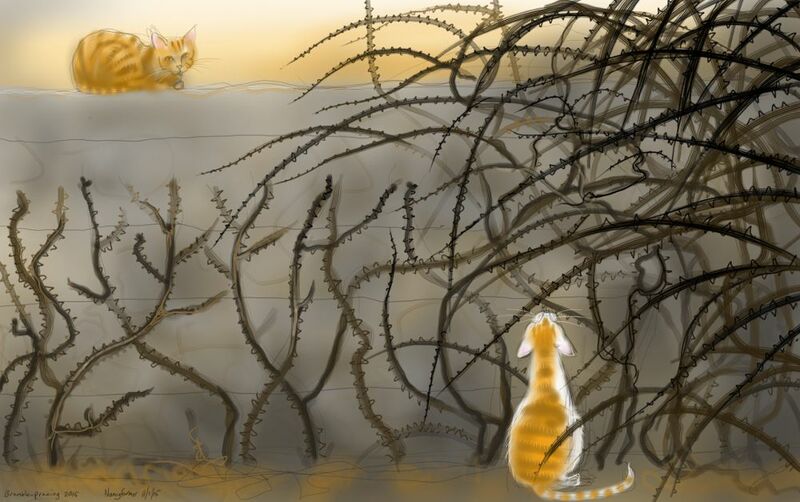 This entry was posted in Cats, Plants and tagged art, arthur cat, blackberries, brambles, cat drawing, cat-of-the-day, illustration, my garden, Percy Cat, pruning on January 11, 2015 by Nancy Farmer.